The fastest and most comprehensive API accessible source of regulatory content for financial services. Compliance.ai provides users with programmatic access to financial regulation data for use in a variety of applications. The API enables developers to add valuable features like topic based search and filters to get real-time insights on changes in the regulatory environment. The API automatically aggregates data from: Federal & State agencies, Enforcements, Regulatory publications from press and independent agencies, White papers, Millions of existing and new rules, Executive orders, and Notices. The API allows for seamless integration of the latest updates in regulations for financial institutions and businesses. 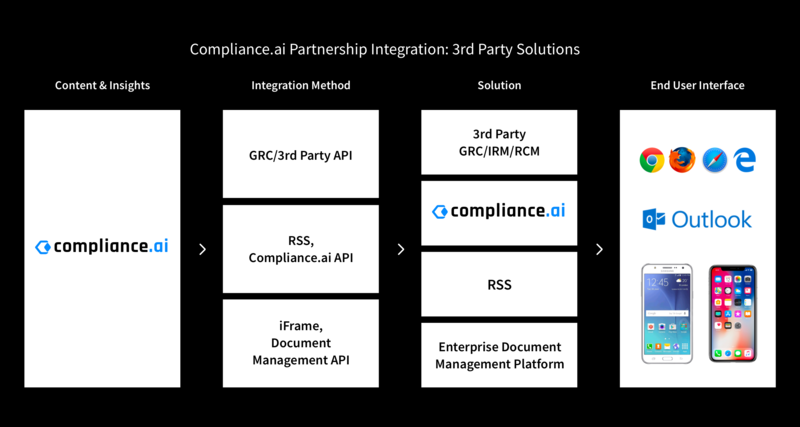 With the integration of Compliance.ai’s data, developers can build new applications, features, and feed information into existing GRC platforms, FinTech application, content management systems and more. The API offers: Access to Normalized information, Content from variety of sources, Vertical streamlined search and Speed to value (easy integration). After creating an account, you can get access to our Interactive API by requesting a Key. You must have a valid key in order to use the Interactive API. Learn how to call our API from your programs. Use our interactive docs (IO Docs) to make a call.